Location: Hacienda Community, La Manga Club, South Golf Course approximately 30 minutes from Murcia Airport and 1 hour from Alicante Airport. Location: El Coto - La Manga Club, North course. 30 minutes from Murcia Airport or 1 hour from Alicante. Description: This 3 bedroom/ 3 bathroom modern air conditioned/heated property is situated in the centre of the resort just minutes walk from the tennis centre, hotel, golf courses and restaurants. 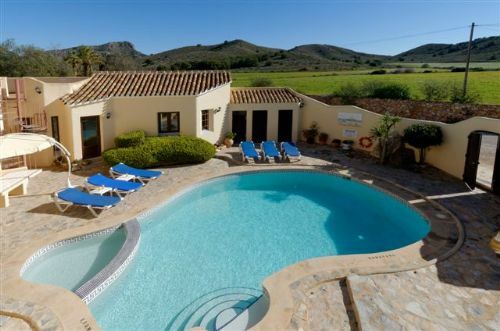 Location: La Manga Club - Individual villas North Course, approx 30 minutes from Murcia Airport or 1 hour from Alicante. Description: This villa is a modern, luxurious, recently refurbished villa situated on the north side of the resort in a quiet position. Nestled into the mountain side all rooms and terraces are able to take advantage of the fantastic views across La Manga Club Resort. This unique villa offers guests a truly wonderful holiday experience with a private, secure garden, swimming pool (heating available at a supplement), astro turf putting green, BBQ area and several terraces with comfortable seating and dining options. There is also a games room to ensure all members of your group are kept occupied! During peak season this property only accepts Saturday arrivals and minimum of 7 nights stay. Fantastic views from nice large villa. Great entertaining areas and sun terraces. Brilliant for big family get together. Location: La Manga Club - Individual villas South Course, approx 30 minutes from Murcia Airport or 1 hour from Alicante. Description: This is an exclusive 5 bedroom villa situated in a quiet position on the resort. The terrace overlooks the 1st Green on the south course with views across the Mar Menor. The pool area is in it's own courtyard making it very private. The villa is fully air conditioned/heated and is available as a 4 or 3 bedroom villa in mid or low season. During peak season this property only accepts Saturday arrivals and minimum of 7 nights stay. Pool heating can be added at an additional cost. 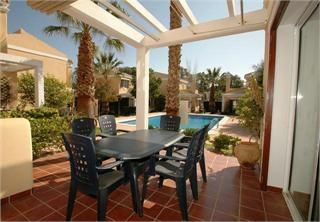 Amazing villa in La Manga Golf resort, the property was fabulous, it had everything you'd want to have when renting a super villa like this one. 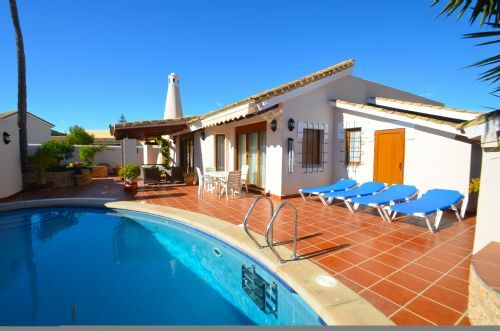 The villa is looked after by Villas Management who are a local managing agency that were amazing, offering top professional service and who dealt with any issues very quickly and so effectively. I can't recommend it enough!! Location: La Manga Club - Individual villa South Course, approx 30 minutes from Murcia Airport or 1 hour from Alicante. Description: 4 bedroom / 4 bathroom villa with private pool. This villa is available to rent as a 3 bedroom villa out of high season.This fully heated/air conditioned villa offers its own pool and private garden. Situated in a central position, only a few minutes walk to the shops, bars and restaurants at Bellaluz square.The main house is on one level, and has 3 bedrooms, whilst another large bedroom with ensuite bathroom is situated on the upper terrace with external access and therefore not suitable for younger children. *This villa has golf discount entitlement for 6 people.The villa offers free wifi internet access . During peak season this property only accepts Saturday arrivals and minimum of 7 nights stay. Description: Situated in the centre of the resort on the exclusive Calle de la Estrella, this extensive 5 bedroom/5 bathroom 5* bungalow style villa offers all one requires for a luxurious, relaxing holiday. Stunning views to lion mountain, golf courses and the sea, private pool along with an outside Jacuzzi, ample terraces and patio areas, ideal for outside dining. There is also a golf practice net, putting green, pool table and table tennis table. The villa is ideal for clients wanting to be able to walk to all the amenities. Saturday arrivals and minimum of 7 nights stay. Description: This exclusive 5 bedroom/4 bathroom fully air conditioned/heated villa with pool has 3 lounges making it perfect for 2 or more families. It also has a games room on the ground floor. The pool can be heated at a supplement. This villa offers luxurious accommodation, situated in the centre of the resort just a short walk from a selection of bars, restaurants, cafes, banks and the tennis centre. 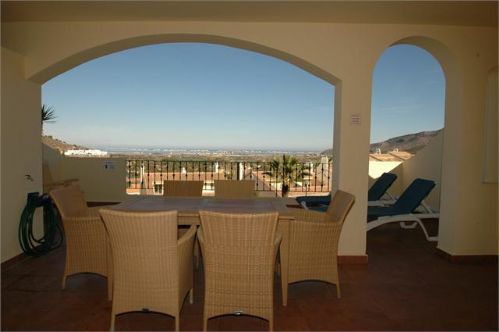 The villa has fantastic views across the Mar Menor and Lion mountain. Please note that this is a large villa set over many floors and therefore has many steps. During peak season this property only accepts Saturday arrivals and minimum of 7 nights stay. This property can be rented as a 4 bedroom villa (except in high season) please call for details. This extensive property is situated in the centre of the resort just a short walk from a selection of bars, restaurants, golf courses and tennis centre. 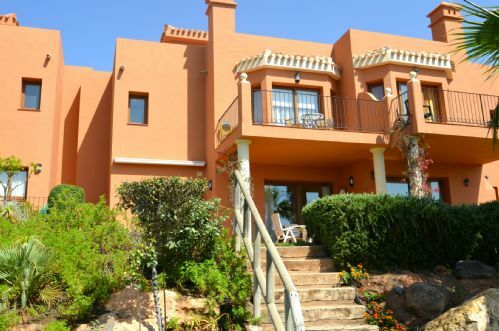 The villa has views across the Mar Menor and to Lion mountain. It also has a games room on the ground floor. Location: Las Brisas Community, La Manga Club, South Golf Course approximately 30 minutes from Murcia Airport and 1 hour from Alicante Airport. 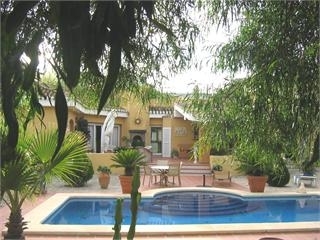 Description: This beautiful fully heated/air conditioned modern villa offers its own pool and a child friendly garden. Situated in a private location but still within a 2 minutes drive to the centre of the Resort, with a large games room for the children. The property is furnished to a very high standard and has recently been refurbished to an excellent level. 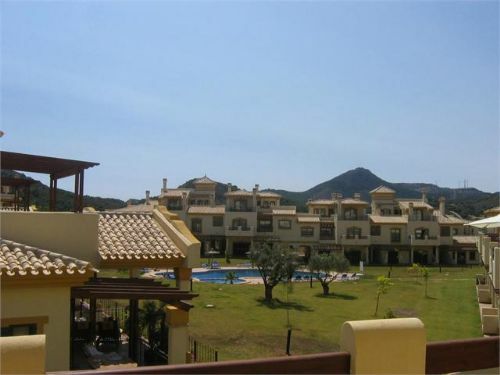 The master bedroom offers fantastic views across La Manga Club. The private pool can be heated. This villa has sports rights entitlement for 6 people and FREE WIFI (Please note there is a minimum stay of 7 nights and during the Peak Summer period Saturday arrivals only). Occupancy: The price shown here is based on 8 people sharing a 4 bed Las Brisas Villa with its own pool. Description: El Gran Palmito is a modern, renovated, spacious, immaculately well presented 6 bedroom / 6 bathroom individual villa with private zero edge pool (heating at a supplement), large garden with uninterrupted views across the Calblanque Nature Park and to the Mar Menor. 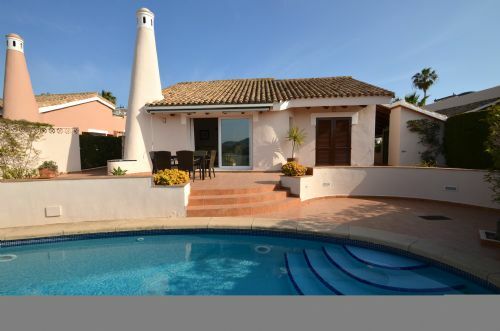 Situated in the pretty Las Brisas community, in a cul de sac offering a quiet position. It is a 15 minute walk to the nearest bars and restaurants of Bellaluz Square and a further 5 minutes to the tennis centre, and a further selection of bars and restaurants. (Please note there is a minimum stay of 7 nights and during the Peak Summer period Saturday arrivals only). Occupancy: The price shown here is based on 12 people sharing a 6 bed Las Brisas Villa with its own pool. Location :- South Course Max occupancy 12. Approx 30 minutes from Murcia Airport or 1 hour from Alicante. Description: This 2 bedroom/ 2 bathroom bungalow style villa has air conditioning/heating and its own pool and private garden. Large terrace area for outside dining or sunbathing. 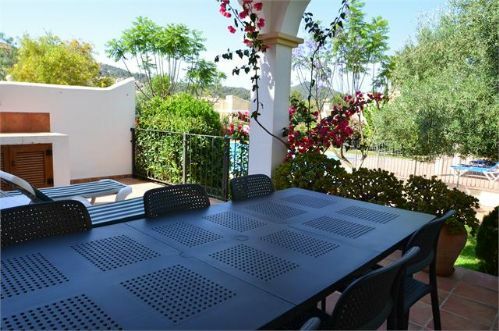 It is situated in a quiet position, but still within walking distance of the tennis centre, shops and restaurants in Bellaluz village. This villa offers discounted golf rates for 4 people. (This property will only accept Saturday to Saturday arrivals during high season July - August). The price includes a welcome pack, air conditioning (where available), pool towels and free wifi. 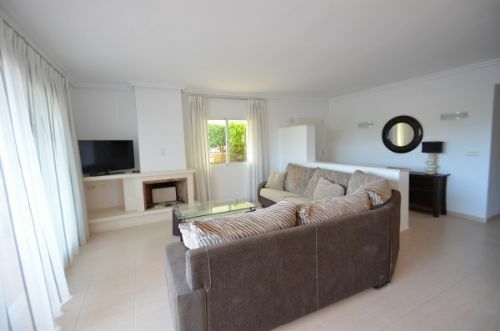 Occupancy: The price shown here is based on 4 people sharing Las Higueras 2 Bed villa. This villa may sleep a maximum of 5 people, extra charges apply for the 5th person. Location: La Manga Club - Las Higueras Community South Course, approx 30 minutes from Murcia Airport or 1 hour from Alicante. Description: This 2 bedroom / 2 bathroom traditional bungalow style villa has air conditioning / heating and its own small pool and private garden. (This property will only accept Saturday to Saturday arrivals during high season July - Aug). The pool can be heated at an additonal charge. Location: Los Naranjos South Course, La Manga Club. Approx 30 minutes from Murcia Airport or 1 hour from Alicante. Description: This modern air conditioned/heated property is situated amongst 20 villas in the centre of the resort just minutes walk from the tennis centre, hotel, football pitches, golf courses and restaurants. The community has 2 pools within yards of the villas, one of which is heated, making it an ideal all year round rental villa. During peak season this property only accepts Saturday arrivals and minimum of 7 nights stay. During peak season this property only accepts Saturday arrivals and minimum of 7 nights stay. Occupancy: Prices shown are based on 8 people sharing a 4 Bed Townhouse. 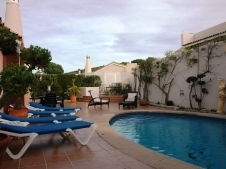 VLN19 is a 4 bedroom / 3 bathroom Townhouse villa located in the central community of Las Naranjos that boasts 2 swimming pools, one of which is heated (seasonal). Popular for families and friends with 4 bedrooms and 3 bathrooms, secluded outside garden area and a separate games / TV room with pool table, air hockey and table football. All La Manga Club facilities are within easy walking distance. Description: This modern air conditioned/heated property is situated amongst 20 villas in the centre of the resort just minutes walk from the tennis centre, hotel, football pitches, golf courses and restaurants. The community boasts 2 pools, one of which is heated, making it an ideal all year round rental villa. During peak season this property only accepts Saturday arrivals and minimum of 7 nights stay. During peak season this property only accepts Saturday arrivals and minimum of 7 nights stay. Location: La Manga Club - Los Olivos community South Course, approx 30 minutes from Murcia Airport or 1 hour from Alicante. Description: This ground floor 2 bedroom 2 bathroom apartment occupies an elevated position in Los Olivos. 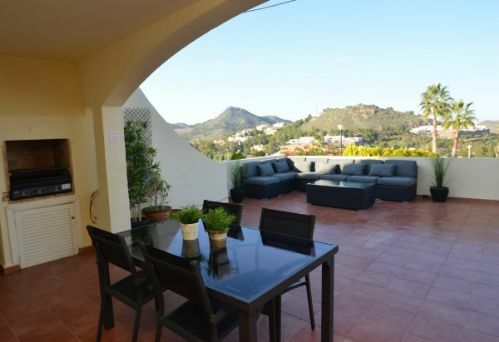 Centrally located with easy access to the Club's facilities, it has stunning views across La Manga Club and beyond. Ideal for families all year round having an indoor pool facility. Fully air-conditioned. Free Wi-Fi with every booking in this apartment. NB the indoor pool will NOT be heated between the 1st June and the middle of September. During peak season this property only accepts Saturday arrivals and a minimum of 7 nights stay. Description: Sleeps: 6, 3 bed / 2 bath apartment on one level. Fully air conditioned/heated. Heated Indoor and outdoor swimming pool. FREE WIFI, FREE POOL TOWELS. Main floor- Lounge/Diner with access to terrace with patio with table and chairs and sun loungers and views. Kitchen with full range of white goods and cooking and eating utensils. Master bedroom with double bed, En-suite bathroom with double sinks, bath and shower. Bedroom 2 with 2 single beds, Bedroom 3 with 2 single beds. Family Bathroom with bath, shower and double sinks.NB the indoor pool will NOT be heated between the 1st June and the middle of September. During peak season this property only accepts Saturday arrivals and a minimum of 7 nights stay. Location: Monte Claro South Course, La Manga Club. Approx 30 minutes from Murcia Airport or 1 hour from Alicante. Description: This recently completely refurbished 4 Bedroom townhouse is contemporary with air conditioned/heateing in the property. It is situated in a central location on the resort. is a very short walk to the tennis centre, golf courses, selection of bars, restaurants, cafes and the supermarket making it an ideal family property. The community has a pool just a few yards across the lawn area to the rear of the villa. During peak season this property only accepts Saturday arrivals and minimum of 7 nights stay. During peak season this property only accepts Saturday arrivals and minimum of 7 nights stay. Description: 4 Bedroom townhouse is contemporary with air conditioned/heateing in the property. It is situated in a central location on the resort. is a very short walk to the tennis centre, golf courses, selection of bars, restaurants, cafes and the supermarket making it an ideal family property. The community has a pool just a few yards across the lawn area to the rear of the villa. During peak season this property only accepts Saturday arrivals and minimum of 7 nights stay. During peak season this property only accepts Saturday arrivals and minimum of 7 nights stay. Location: La Manga Club - Monte Claro community South Course, approx 30 minutes from Murcia Airport or 1 hour from Alicante. Description: The Monte Claro community is ideally located, just a short walk from the tennis centre, shops and restaurants. The town houses feature amongst the most popular choices with guests. With a superb community pool and beautiful gardens, they provide an ideal holiday location. This 4 bedroom/ 4 bathroom modern air conditioned/heated property is situated amongst 20 villas in the centre of the resort just minutes walk from the tennis centre, hotel, golf courses and restaurants. This Monte Claro 4 Bed / 4 Bath individual Villa with a private pool is one of Design's favourite properties. Client's who stay here book again and again each year, so impressed they have been with the specification and location. During peak season this property only accepts Saturday arrivals and minimum of 7 nights stay. Description: The Monte Claro community is ideally located. The town houses feature amongst the most popular choices with guests. With a superb community pool and beautiful gardens, they provide an ideal holiday location. This 5 bedroom/ 4 bathroom modern air conditioned/heated property is situated amongst 20 villas in the centre of the resort just minutes walk from the tennis centre, hotel, golf courses and restaurants. This property also has a games room. During peak season this property only accepts Saturday arrivals and minimum of 7 nights stay. Description: The Monte Claro community is ideally located, just a short walk from the tennis centre, shops and restaurants. The town houses feature amongst the most popular choices with guests. 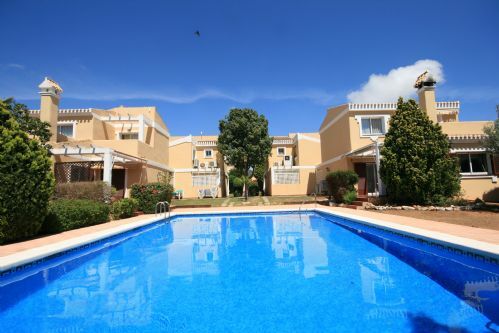 With a superb community pool and beautiful gardens, they provide an ideal holiday location. This 5 bedroom/ 5 bathroom modern air conditioned/heated property is situated amongst 20 villas in the centre of the resort just minutes walk from the tennis centre, hotel, golf courses and restaurants. This Monte Claro 5 Bed / 5 Bath individual Villa with a private pool is one of Design's favourite properties. Client's who stay here book again and again each year, so impressed they have been with the specification and location. The property has a pool heating facility (at an additonal charge). During peak season this property only accepts Saturday arrivals and minimum of 7 nights stay.